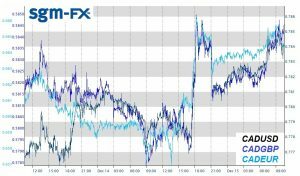 After a busy day on currency markets yesterday, the biggest mover ahead of today was the Euro, followed closely by the Pound. Heightened volatility was unsurprising given the central bank monetary policy decisions that occurred in the underlying economies of the respective currencies. Monetary policy decisions from the Bank of England and the European Central Bank yesterday left both monetary policy instruments and expectations on hold. The ECB confirmed that it will restrain asset purchases in the new year at €30bn, down from 2017’s €60bn average and crisis highs of €80bn. Following a recent hike, the Bank of England Rate is held at 0.5%. The EU summit concludes today, allowing market movement. Politics or Economics? The Pound’s internal conflict is leading to interesting dynamics on forex markets. The United Kingdom’s polity and economy have both thrown up surprises, frequently in opposing directions, that are causing a cautious pound with considerable average intraday volatility. Yesterday afternoon saw the UK parliament strike a blow to Theresa May by voting through an amendment to the government’s cornerstone Brexit legislation, and allowing the UK parliament a full vote on any Brexit deal before government implementation. This political result creates two devastating effects to May’s leadership. Firstly, the defection of party members voting against strong government whips publicly conveys an air of weakness to the incumbent government. Secondly, in more constitutional terms, the amendment turns Brexit into a more salient partisan affair, by equating the composition of the Commons with the ratification of a Brexit deal. Sterling’s interesting internal dynamics are raised by the expectation of imminent EU Council approval for second round progress. The conflict questions what is more important; internal or external politics? Similarly, slow economic progress with the Bank of England decision leaving policy expectations unchanged extends Sterling’s existential crisis further: how should all this news be priced into the Pound? The progression of the European Union, and not least the Euro, is often referred to as the European experiment; and rightly so. The stab in the dark, beginning less than a decade after the conclusion of the second world war, was revolutionary. Now, however, the experiment is changing and, in my opinion, spilling over into markets. Any single currency that is achieved by the amalgamation of many domestic currencies will always bring new challenges. However, even more so than with the Pound, discussed above, a central challenge is isolating the arena of salience to a collective currency. Westminsterial politics is the traditional ground for UK political developments; a certainty that cannot be ascribed to the Euro area. In what should be a focal point for the Union’s and Eurozone’s politics, today’s Summit is still dominated by national idiosyncrasies, not least Brexit. Yesterday, a steady outlook for European monetary policy summarized the same message: growth is good, however, the average price level (inflation) remains highly illusive. Without wage growth, the value of the Euro may be subdued. Yesterday’s decision saw the Euro fall 0.7% to 1.178 against the Dollar and 0.8765 vs. Sterling. Yesterday evening, equity markets in the US closed in the red lower, reflecting concerns about the viability of Trump’s tax reform bill. This morning, the Dollar has opened mildly lower on European markets, continuing last night’s trend. Trump’s optimism for reform before Christmas may well be taken at face value by markets, creating a risk that the year-end balancing that typically favours the Dollar, and has done so far throughout December, might be undermined and even reversed. Yesterday evening Governor of the Bank of Canada, Stephen Poloz, gave the first hint that Canada will require “less monetary stimulus over time”. This comment strengthened the Canadian Dollar by over 1%, making its purchase more expensive.